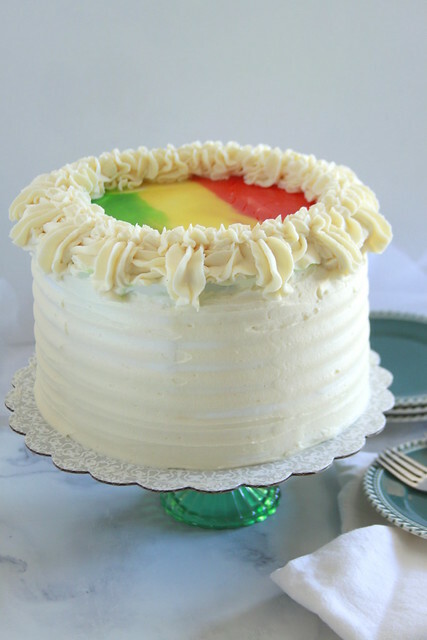 Hawaiian Paradise Cake is the perfect gateway for summertime! 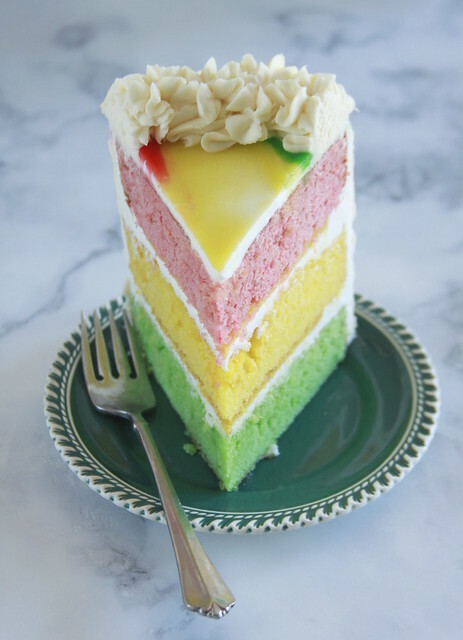 You the feel the balmy warm weather with this tropical trifecta of guava, passion fruit, and lime cake layered with zesty lemon curd and wrapped in a whipped cream cheese frosting! 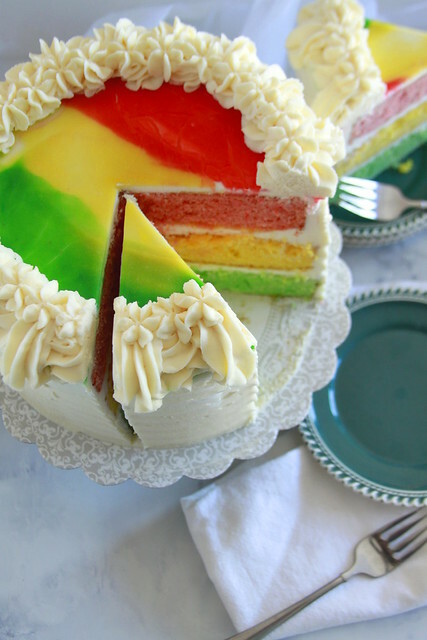 You may not have a plane ticket, but you can surely travel to warmer climates with this Hawaiian Paradise Cake. The Hawaiian Paradise Cake is a mainstay dessert at King’s Hawaiian Bakery and Restaurant located in Torrance California. King’s Hawaiian is, yes, related to those soft and downy bread rolls. You know the ones, the rolls you could eat 1 or 20 and your stomach wouldn’t feel the impact. Your appetite would only beckon for MORE. You would think the bakery/restaurant would be Hawaii, but alas, no. In the 1980s King’s Hawaiian moved headquarters from Hawaii to California and opened the full service bakery. Looking at the Hawaiian Paradise Cake, you can see a reflection of Hawaiian fusion that is prominent in local (not native) Hawaiian cuisine. The typical fruit forward flavors are front and center. Light and airy textures, more popular in East Asian desserts, play a key role. The cake and the frosting have a fluffy quality. Search the internet and you’ll find a slue of interpretations, boasting legitimacy and sublime flavor. So why try mine? Cakes are like a symphony, each component is like a group of instruments and sectioned into parts, creating a cohesive end result. You want contrast alongside harmonious unity. 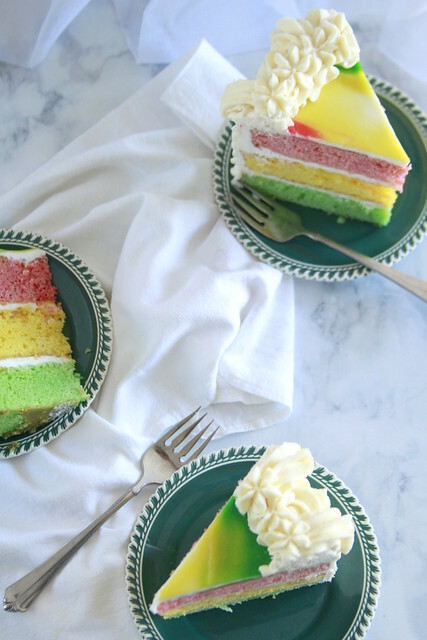 I’ve used this cake recipe several times like here , and it carries the best qualities of a moist butter cake with an airy chiffon cake and mashes the two together. 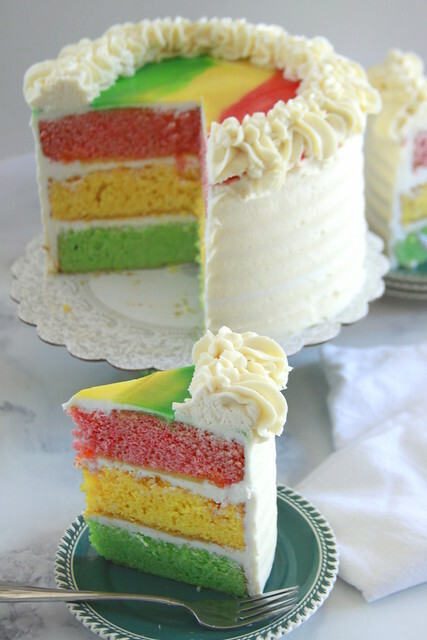 Instead of a crumbly and dry cake, you get satisfying moisture without any heavy-lead density. There’s just enough fruit flavor from the cake and curd to discern each fruit, without a puckering, sour pain. Finally, to contrast the cake and curd, there’s a light-as-air whipped cream cheese frosting. You may roll your eyes at my excessive use of cream cheese, but here me out. 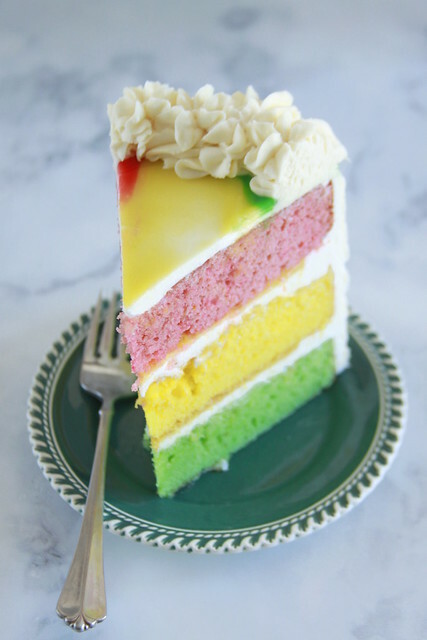 To me, a plain whipped cream coating is an injustice to this cake. Not only does whipped cream provide little flavor, it has zero structure and yields a wet and sloppy slice of cake. Here, this whipped cream cheese frosting is half frosting and half whipped cream. The cream is stabilized by cream of tartar and folded perfectly into a vanilla forward cream cheese buttercream base. 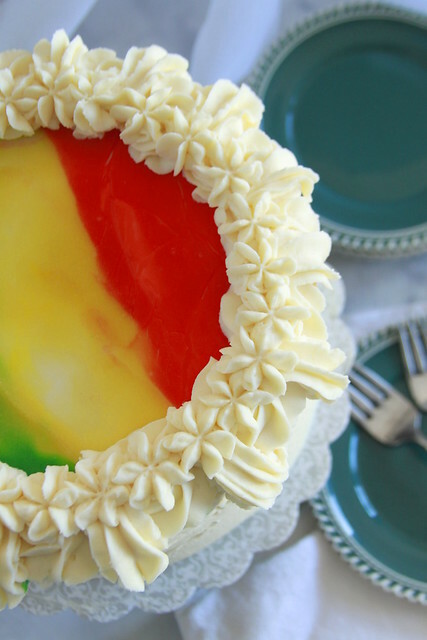 So get summer rolling with some Hawaiian Paradise Cake! Preheat oven to 350 degrees F. Grease 3 8-inch cake pans with baking spray, set aside. Whisk together flour, 2 ¼ cups granulated sugar, baking powder, baking soda, and salt together. In another bowl whisk together buttermilk, melted butter, oil, vanilla, egg yolks, and lemon zest, set aside. In a stand mixer fitted with a whisk attachment, beat egg whites at medium-high until foamy, about 30 seconds, gradually add remaining ¼ cup granulated sugar and raise speed to high, beating until soft medium peaks form, they should still be moist. Transfer egg whites to another bowl. In the now clean and empty mixing bowl and whisk attachment, add dry ingredients. With mixer's speed on low, gradually pour in wet mixture until incorporated. Scrape sides and bottom of the bowl down. Return mixer's speed to medium-low, beating until smooth and incorporated, about 10 to 20 seconds. Divide the batter into three equal parts (I weighed it out to be about 14 to 16 ounces). For each portion stir in one of the puree or juices along with the corresponding color (red for guava, yellow for passion fruit, and green for lime). Divide the egg whites into three portions and fold each portion into each different flavor. Pour batters into prepared pans and bake for 20 to 25 minutes, rotating halfway. A toothpick inserted should come out mostly clean with a few moist crumbs. Do not over bake these cakes! Let cakes rest in pans for 5 minutes before inverting onto a wire rack to cool completely. Wrap in plastic wrap and refrigerate overnight, this will create a moister crumb. In a small saucepan over medium heat, warm lemon juice until hot but not simmering. Whisk eggs, sugar. Slowly whisk hot lemon juice into egg-sugar mixture. Pour back into the saucepan and cook over medium heat, about 3 minutes, whisking constantly. Once it thickens and coats the back of a spoon, remove from heat, add butter, heavy cream, vanilla, and salt. Pour into a heat-proof bowl, cover in plastic wrap and cool, refrigerating until ready to assemble. in a mixer fitted with a paddle attachment, beat cream cheese until smooth, about 2 minutes. Remove cream cheese. Switch to a whisk attachment. In the now clean mixing bowl combine heavy cream, powdered sugar, cream of tartar, and vanilla, whipping until stiff peaks form. Add beaten cream cheese back into mixing bowl, whipping at a medium speed, until combined, about 1 to 2 minutes. Apply a bit of frosting onto a cake board. Place the lime cake onto the board and apply a thin layer of frosting, followed by a thing even layer of lemon curd. Repeat this process with the passion fruit layer, finally topping with the guava cake layer. Give a thin crumb coat of the frosting, chill for 15 minutes, and then apply a thicker layer of the sturdy whipped cream. Dye remaining lemon curd and swirl on top of cake pipe of border with the remaining whipped cream.